Most of us who served "back in the day" have fond memories of Hollywood stars who entertained service men and women at USO shows. 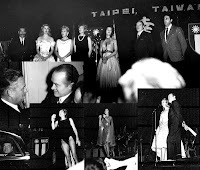 Sarj Bloom sends a collage of photographs that were taken during the 1962 Bob Hope Christmas USO Tour. At this time I was no longer the junior PO in the lab, so PH3 Gallagher was assigned to shoot these photos. I got to sit in an aisle seat and almost got on the TV taping. Hopefully some of the visitors to the site will remember this show. I remember it being downtown but can't remember where. Stev has a better memory than me of places and locations, and maybe he or someone else who was there can name the building. Guest Stars: Les Brown and band, Anita Bryant, Amedee Chabot, Miss U.S.A., Jerry Colonna, Peter Leeds, Janis Paige, Lana Turner. left to right in group photo : Jerry Colonna, Miss U.S. A. Amedee Chabot, Lana Turner, Janis Paige, Anita Bryant, Bob Hope, Peter Leeds. I remember the Bob Hope show well. There was a long line of U.S. military outside the theater waiting to get in and of course the place was packed. The venue was Taipei City Hall, but the English name was really a misnomer. City Auditorium would probably be a better translation. It was the scene of most major shows in Taipei in those days, including the annual Double Ten Day celebration.